The Funky Felter: I'm a vendor at Friday night's Kansas City Etsy Street Team Trunk Show! Go Green with KCEtsy! I'm a vendor at Friday night's Kansas City Etsy Street Team Trunk Show! Go Green with KCEtsy! This Friday evening, I'll have a table full of felted goodness at the KCEtsy "Go Green" St. Patrick's Day Trunk Show! I hope you can drop by to browse and shop! 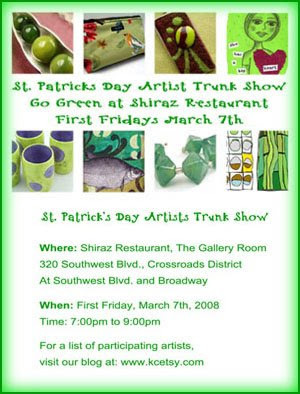 The Kansas City Etsy Street Team is teaming up once again with Shiraz Restaurant this month, to participate in the Crossroads Art District's First Fridays. Admission to the KCEtsy "Go Green" Trunk Show is free and open to the public. Buy a glass of wine at the bar and join us in the Gallery Room to talk with the artists, and shop their amazing handcrafted items. Read more about the show and all of KCEtsy's lovely artisans at www.kcetsy.com!